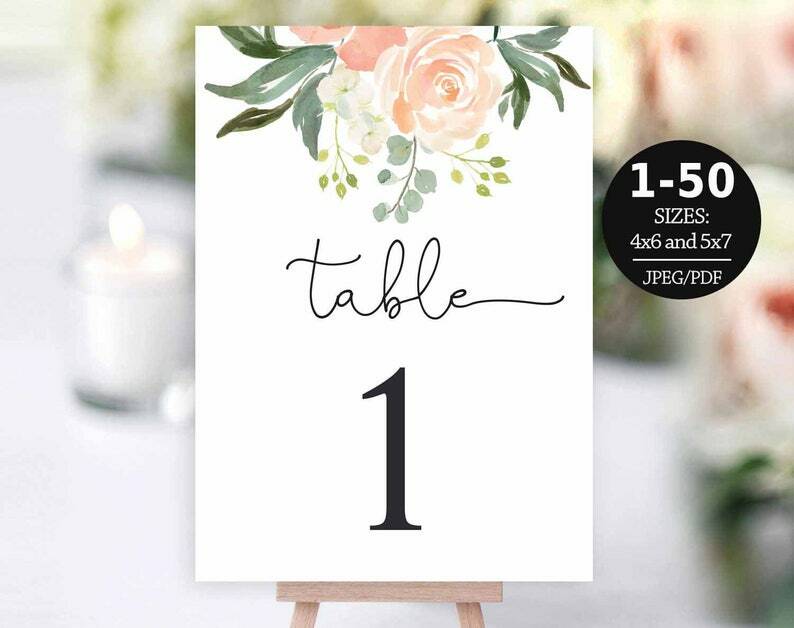 Purchase this listing and you can then instantly download your table numbers once your payment has completed. Please note, the files are not editable! Size: Each table number is 4"x6" and 5"x7"
• Printing is not included. • The appearance of colors may vary on your printer or computer. • Files may be printed for your personal use only and may not be re-sold, distributed or used for commercial purposes. Vicky wasn’t helpful in the least when it came to adjusting the bleed. We spoke back and forth and she said to read the fine print BEFORE ordering, but the print said that she would fix bleed. She clarified that it was only referring to business cards, but there was no way I could have known that before the purchase. I explained to her that it was in the fine print and she said I should’ve read the FAQ before buying. I checked the FAQ (who does that before buying anyways?!) and it said nothing about not fixing bleed for table numbers. She also said she’s “too busy” for custom orders (which this is not custom, it’s adding bleed to a design already created). I was so frustrated and ended up purchasing a different template for my wedding. The people there helped adjust bleed and were much more friendly. Hm..This is NOT what I told you :-) I told you: You should have read the product description before your order. All products have their own product description. The bleeds are for the business cards. The bleed information is in my FAQ and in my Terms And Conditions information and they appears on every page when you open an Etsy product. They includes frequently asked questions about my products. Also.. only the product description describes the product. I think this is very very clear..
Where is my Instant Download file? If you purchased an instant download, you will be taken to a page to download your file after check-out, if you missed it don't worry! Let's start with Apple users, if your'e on a Mac, it's super easy, just double-click and it will open it up into a new folder for you. Voila! If you're on a PC, and are running Windows 7, 8.1 or 10 then Microsoft can automatically open these too. To unzip all the contents of the zipped folder, press and hold (or right-click) the folder, select Extract All, and then follow the instructions. Alternatively on a PC, you can head to the website 7-zip http://www.7-zip.org/download.html and download the version for your computer. Install it, and then open the zip with that instead. All the files that I send you have a high resolution 300 DPI. If your file have is low resolution and blurry text, then you saved it wrong. When I send a file to your email, please do not use "Save as...", use the "download" button. "Save as.." may be used only when you open a file from a personal message on etsy, in this case, open the original file with a good resolution, in other cases the picture will be blurred, so please use the "download" button. That would sadly be a no. It's simply because this is a 100% digital product. This means there is nothing touchy feely, sniffable or physical about it. Phew! So instead, what you'll receive is a digital file or two, which you'll be able to download immediately - YES IMMEDIATELY - after purchasing. By offering digital downloads like this allows me to serve all my worldwide customers super easily, saving you precious money that you can spend on your honeymoon or something to make a magical memory for that special day! Can you provide a custom order for me? Sorry, we are not able to provide custom orders at this time.